Check the accuracy of your software and firmware. 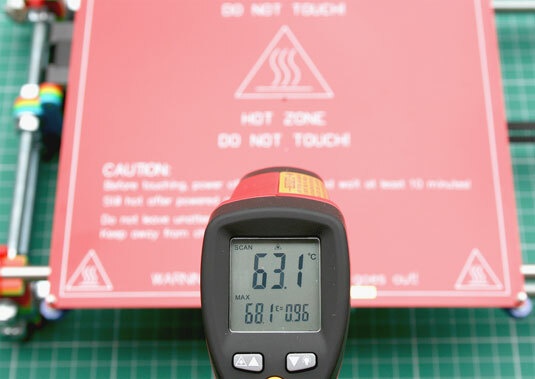 Always make sure that the temperatures reported by your firmware and software are accurate. This check can resolve a lot of common problems and extend the life of your 3D printer. You can check the temperature in several ways. One of the best methods is to insert a thermocouple probe into the hot-end nozzle. Or invest in a noncontact digital laser temperature sensor, which sells for around $30. To use it, point the laser at the place you want to measure. This device is good for checking the temperature of the heated print bed, motors, and drive electronics. Use a noncontact laser temperature sensor to make sure that the parts of your 3D printer are running at the correct temperatures. Verify the temperature of your cold-end. It’s a great idea to check how hot the cold-end (thermal barrier) is getting on your hot-end. The cold-end’s temperature needs to stay below the glass-transition temperature of the material you’re printing. This limit is most critical for printing polylactic acid (PLA) materials, so check your extruder when it has been turned on and printing for 20 minutes or so. If the extruder heats up more than 50 degrees C, consider adding a cooling fan. Make sure that this fan points across the cold-end part of the extruder, not toward the hot-end or the object being printed. Some 3D-printer kits come with a fan to cool the cold-end of the extruder — usually, a very good idea. A fan isn’t always necessary, but having your incoming filament go quickly from cool to melting temperature is much better than trying to push a plug of heated, semisoft, rubberlike material into your extruder nozzle. Keep your filament free of fluff. Add a fluff-capturing device to your 3D printer, because dust and fluff on the filament going into your hot-end can clog it and eventually jam the nozzle. Such gunk is very hard to clear out. A piece of sponge, secured around the filament with a zip tie, catches fluff and stops it from entering your extruder. 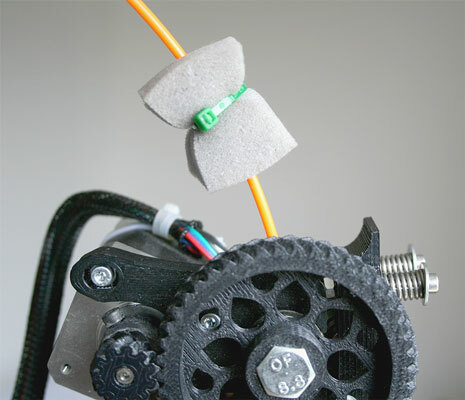 A piece of dry sponge keeps fluff, grease, and dust from entering (and jamming) the tiny nozzle of your hot-end.